Rion SA-02 is a multi-channel signal analyser platform which is compatible with the input of piezoelectric accelerometers as well as microphones. The SA-02 vibration analysis platform allows up to 32 channels of measurement. 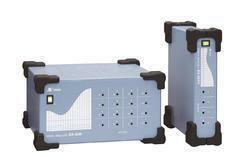 The SA-02 Multi-channel signal analyser combines FFT Analysis with 1/1,1/3,1/12 Octave band analysis. The SA-02 can be paired with a wide variety of application specific programmes to further enhance its capabilities.